"You can't be beaton. Great staff. Spotlessly clean. Good food and hospitality." "Excellent stay once again. Lovely friendly staff and a warm welcome. Thanks." "Fab. Loved it. Will come back very soon"
"On behalf of the Coventry CHA rambling club I would like to say a big Thankyou to you and your staff. 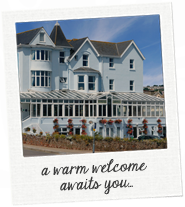 Your hospitality has been amazing, your hotel is warm and welcoming , the rooms comfortable, clean and airy. Chef the food has been wonderful, perfect for hungry ramblers. We haven't really seen you and your staff but Thankyou so much for delicious meals. To you young waiters we Thank you for being so efficient and professional, you are a credit to the hotel. You were cheerful and friendly and served us…"
"On a personal note now. Thankyou for a wonderful time in your hotel. You obviously enjoy your job your personality oozes out and reaches your visitors. Sharon and Steph should also be singled out. They made the evenings hilarious at times. We loved that. I am sure we will all return for another holiday"
"A very happy stay. First time we've been, but will definately come again. Thanks to all." "Excellent hotel. 5 Star service and staff. Made our short break a pleasure. Well done"
"2 Star - Never! Couldn't be more pleased with everything, will certainly recommend"
"Compliments to the chef and all his staff for their good work." "Really good holiday. We enjoyed being here and will definately come again. Superb evening entertainment. Thanks to everyone, you're all fantastic"